Everything you’ll need to know to get those perfect printed T-Shirts! Printed T-Shirts? What’s the big deal, right? How’s a T-Shirt going to help sell your brand? No one looks at them anyway… right? Well, printed T-Shirts are one of the most effective means to promote your label and can make all the difference in making your brand stand out from the crowd. Just imagine, one day out on the stall, handing out flyers to everyone passing by. They’re enthused, they’re intrigued, you’re drawing in the crowds with your captivating designs and brand! But wait… Who’s that setting up a stall directly opposite you? What are they wearing? Printed T-Shirts? And they’re handing them out, for free!? The SCANDAL! Well, not like it matters… right? Wait, where did everybody suddenly disappear to? They’re suddenly surrounding the stall on the opposite side! And there it is: “Why didn’t I endorse my brand through promotional merchandise, such as expertly printed designs on cotton-based clothing?” Yes, head of marketing and design, why didn’t you? Back to the real world. It is important to recognise the true value of printed T-Shirts when endorsing your brand. Whether it be handing them out to customers so that they too can advertise your brand (whether they realise it or not), or being sported by your promo team on the stalls, people are drawn in by attractive, professional designs. So, what are you waiting for? Do you have an idea? Nice! Our Printing Specialists will guide you through the entire printing process. Now that we’ve got the ball rolling, I bet you’ve got a million ideas bobbing around in your head about how you can use printed T-Shirts to endorse your brand. But hey, if you don’t, no problem. That’s what we’re here for! Contact us today or send us whatever you’ve got. Don’t feel pressured to have it all perfect first time, our graphic designers will work out all the kinks and have it looking just right, making sure to match your brand Pantone guidelines and everything. From bags to pen drives, from aprons to bottle openers, we can print on just about anything! If you can imagine it, we can print it. We are experts in screen printing, sublimation and… well, virtually any type of printing, really. No matter how big or small your event or business is, or how obscure the item is you would like us to print onto, we’ll find a way to accommodate you. We pride ourselves on being specialists in the field. What’s that? You want 1000 T-Shirts? No problem! There is no order too big. In fact, in terms of price breaks, the bigger the better as you’ll pay much less per unit. Let us know how many you need and we’ll make it our priority to accommodate you. Even with the tightest deadline, we can get your printed products to you on time. We offer same and next-day T-Shirt printing, as well as other express delivery services on all items. So if you’ve got a last minute order for an event or fundraiser, relax, we’ve got you covered. On our website, you’ll be able to see that we have a wide range of colours that will look great emblazoned with your design. And let’s not forget our sublimation printing technique. This method allows you to print full colour designs and photographic quality images, making your printed T-Shirts stand out more than ever..Learn more about sublimation printing here and find out about the endless possibilities! It is however worth pointing out that when printing black ink, we can’t really achieve true black, as the T-Shirts can only absorb a certain amount of ink, this resulting in an off-black print. You should also note that sublimation works best on white synthetic fabrics, such as polyester. Any further questions regarding colour we’d be more than happy to oblige. What is the print position? On the front? On the back? Upside down? At an 83.27658-degree angle? No problem. Just bear in mind that you can print anywhere minus over the seams. Also, if you have a T-Shirt with a pre-existing print you’d like us to work around? That’s not an issue at all! 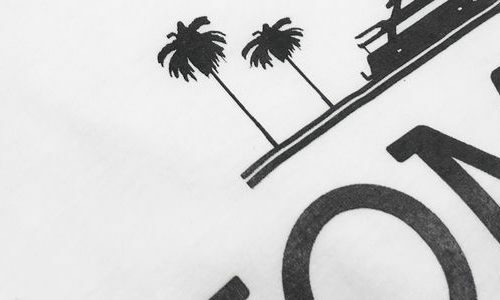 Though you can print over the entirety of the garment with sublimation printing, one of the only issues is that white marks may be left following the process, but that’s completely normal and rather unavoidable. These marks are commonly found around the armpit area, so maybe best to avoid those armpit-based designs you love so much! How can you create the perfect final design? Can you ever really create the perfect final design? There’s always something that could be better, right? Even if that is the case, don’t worry about what your design will look like in 5 years’ time; trends and styles are always changing and we’re here to find the right design for the here and now! Already have your design? Nice. We’d be more than happy to get that printed for you, we’re sure it’ll look amazing. Have something in mind, but you’re not quite sure? Just let us know, we’d love to hear your ideas and our designers will be more than happy to get something drawn up for you; we charge a fee of £25 per hour, a small price to pay for the perfect design! Get in touch with us today and let us know whatever your brand needs and we’ll reply within 15 minutes.